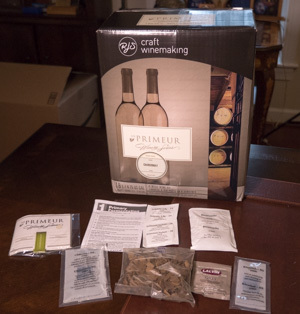 This week I take a look at what’s needed for the average beer brewers to make wine from a kit. Making wine is actually an order of magnitude easier than brewing beer, though it requires more time to age. The good news is that the average beer brewer already has the equipment needed to make wine from a kit. I’m not a wine guy. We have a dozen or more bottles of wine people have brought to the house as gifts when we have a party, and they basically sit unopened until the next time we have a party. My preferences are beer, mead and home made cider, though I’ll occasionally have wine with a nice meal. You can keg your wine – no need to mess with bottles if you already have a keg system – just run the keg at very low pressure to avoid carbonating the wine. If you want to bottle there are also corking options (Zorks) that don’t require a corking machine. It can take anywhere from 3 months to a year or two to reach peak flavor, so patience is required. The average beer brewer has all of the equipment already to make wine from a kit. If you can mix ingredients with water in a bucket you can probably make wine from a kit. Sanitize everything just like you would for beer making. Primary fermentation can be done in large plastic fermentation pail, and all you have to do is follow the instructions and mix the grape juice with some water, yeast and sometimes finings. After little more than a week, you transfer from the primary to a secondary (usually a glass carboy) and let it sit for another week or two. Then you transfer again, stabilize the wine by adding some sulfites/sorbates and add finings to clear it. Wait a few more weeks for the wine to completely clear and then add the flavor pack (if there is one) and bottle or keg it. Some higher end kits require an additional racking and time before bottling. Finally the waiting game begins as it often takes anywhere from a few months to a year or more to reach peak flavor. The only equipment the average beer brewer might not have is some kind of “degasser” (Amazon Aff Link – this is the one I use) which is a paint stirring or whisk device that is used with a drill to remove the CO2 from the wine, usually before clearing. Also if you want to bottle your wine you may need to get bottles and a corker, though I’ve had success using Zorks (a press-in plastic cork) (Amazon link) and a rubber mallet instead. Since standard wine kits are 6 gallons (23 liters) you may also need a larger carboy for aging. It takes about 15-18 pounds of grapes to make a single gallon (4 liters) of wine which works out to as much as 108 pounds of grapes for a 6 gal (23 l) batch. These are wine grapes – not the grapes you get from your local supermarket. You will probably not be shocked to hear that a sub-$50 wine kit that makes 6 gallons (23 l) of wine does not actually have 108 pounds of concentrated high quality hand picked designer vinyard grape juice in it! To make the $40-50 kit a lot of corners are cut, only a few liters of juice is included, fruits and sugars are added, and you will actually get something closer to a wine cooler in terms of body and flavor. The more you pay for a wine kit, the more you get in terms of not only the amount of juice, but also the quality of the ingredients. However, the more expensive kits also get closer to the real ingredients wine makers use, which means they require more aging – as in years of aging. Also red wines require more time to age than whites because red wines are made with the grape skins included in the must, which means they have more bitter tannins that take longer to break down and mellow. To summarize: Higher priced kits have higher quality ingredients, more quality grape juice, and take longer to age. Reds take longer to age than whites. Many people start making wine with these “fruity” kits, which (as of this writing) are in the $50-70 range. They generally include only 5-7 liters of actual grape juice for a 6 gallon kit, but also include a flavor pack (often called the F-pack) that you add just before bottling to give it some body and fruity flavors. If you follow the instructions you will get a low gravity, low alcohol, low body wine perhaps in the 5-7% alcohol range. Many home wine makers boost the alcohol up to 9-12% by adding 3-4 pounds of sugar, though this does nothing to increase the body. These kits often compensate for the low body and lower quality juice by adding either artificial or natural fruit flavors in the flavor pack. They can be quite enjoyable and drinkable if you pick a fruit you enjoy, and are often served chilled and even carbonated. They are also ready fast – often drinkable within 4 weeks though they will get better if you can give them another month or two. These kits include roughly 10-12 liters (2.5 gal) of a blended grape juice, and you add water to make a 6 gal (23 l) wine. This means they have medium body and also a higher alcohol content. Most ferment out in the 10-13% range which is average for a wine. You will get better aroma, and better body from the wine. While they can be ready to bottle in as little as four weeks, they generally must be aged a minimum of 2 months and will likely improve with time up to a year or more. Some red wines include grape skins which will improve the body and flavor, but these kits also take more time to age due to the tannins added. If you are patient, you will generally get a pretty decent quality table wine (or better) from a mid-grade kit. These kits include 15-18 liters (4-5 gallons) of high quality wine grape juice and only require 1-2 gallons (4-8 l) of additional water. The kit itself weighs 45 lbs (20 kg) or more! They generally ferment out in the 12.5-14% alcohol range, while still retaining strong body, flavors and aroma. The juice used is often from specific wine growing regions and is made from specific grape varieties instead of being mixed of blended. Red wine kits in this group often include grape skins or rasins which add flavor, body and aroma but also increase required aging time, and oak powder or chips are often used. They look expensive, but even a $200 super premium kit translates to a per-bottle price of $6.89 for the finished wine (not including bottles/corks) which is cheaper than the average $10-12 table wine here in the US. While they can make exceptional quality wine, the downside for these kits is the aging time required. Generally they can be bottled in 6-12 weeks but will require anywhere from 9-18 months to reach peak flavor, and may continue to improve for years. As with other kits, white wines will reach peak flavor well before reds. Its best to bottle these kits and then set them aside, then mark your calendar in 6-9 months to give them a sample tasting. Also be sure to use high quality corks (or Zorks) as lower quality “aggregate” corks are generally good for less than two years. This is a “catch all” group which includes very high quality “23 liter” kits, limited release kits that manufacturers release only for a short time, dessert wines, and also specialty wines like ports. The “23 liter” kits require no water addition and are basically prepared wine must that you ferment at home. They are expensive, but also use high quality ingredients that should yield exceptional quality wine. They can be bottled in four months, and require 9 months to 18 months to age. Dessert wines usually make smaller batches of 11.5 liters (about 3 gallons) and do not require water additions, but are sometimes fortified with sugar to increase alcohol content. They can be ready to drink in as little as three months, but will improve if you can wait a year or more. The seasonal “limited release” kits are often released each year starting in August and ending in November. 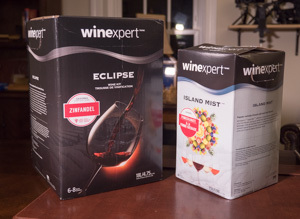 They usually include wine styles and regions that are not in the regular line of kits and can in some cases sell out very quickly. If you have the patience, wine making can be a rewarding adjunct to your traditional beer offerings that can be fun to play with. Thanks for joining me on the BeerSmith Home Brewing Blog. Be sure to sign up for my newsletter or my podcast (also on itunes…and youtube…and streaming radio station) for more great tips on homebrewing. Effective blog. The way of conveying the information is very good. keep on. Fantastic guide Brad, thanks for sharing!